4 plans. With $86/mo you get access for 1 user. 20% off when paid yearly. Pros: Knowify has many modules that are useful, however they do not all work with QBD quite yet. Once they can get the sync figured out it will be a one-stop-shop for estimating, time-tracking, invoicing, scheduling. We do not use the Plan and Track feature, but I can see how that could be VERY helpful. Emailing customers is very easy. Purchase orders are EASY to send. Getting customer signatures is EASY. Cons: 1) The billing module is very detailed, so it takes a long time to enter bills. There should be a shortcut around entering an "Item" that allows choosing an expense account. And maybe allocate to the job not based on an item in contract. Also Autofill feature? Or a Copy previous bill? 2) Default accounts are confusing. For a long time they did not save after I entered them. And many of them do not allow us to choose a COGS type account. 3)Time tracker does not sync at all. 4) Sub customer doesn't autofill address of top customer. 5)Estimate/Invoice template formats are not editable - I want to adjust which fields and where they go on the document. 6)Can't do a $0 estimate -sometimes a customer wants to choose from options. 7) Class info did not sync 8) In Plan and Track the work order should autofill item description from the contract 9) t would be great if Comments were visible in Time entries Instead of having to click on them to see. Overall: The online-ability is great for the boss in the field, but with QBD we have had to establish work arounds. Pros: By far the best feature of Knowify is that, with a seemingly simple but comprehensive interface, the program is intuitively generating more beneficial outputs, then we could first imagine. Cons: At first blush the interface seems very directed in how one should use it, but we began, after working with the demo, to find it slightly obtuse when faced with little ideosyncrasies common to many contractors. So far the team at Knowify has not disappointed in aiding us with these minor hiccups, which tended to be a lack of understanding on our end about certain settings, and not the program itself. 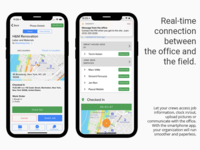 Overall: Knowify is singularly impressive in it's ability to speak to both the complex and real time needs of contractors while satisfying the employee, office staff, and the accountant's requirements. Our office has tried repeatedly to classify this program, as estimation, project management, AR, job costing, etc. when speaking with clients, and ultimately with each new client we find it is more than that, it is simply the right answer for the right problem for contractors. Combine Knowify's ever growing list of built in (and truly astonishing) benefits, with a staff who are willing to take our's, and I'm sure many, users suggestions for improved useage and the result is a company you want to see leading the market. Recommendations to other buyers: This program has a good deal of flexibility, but it was definitely designed with process flow in mind. If you are an accountant, don't try to come at this like your accounting software it is much more directed than that. 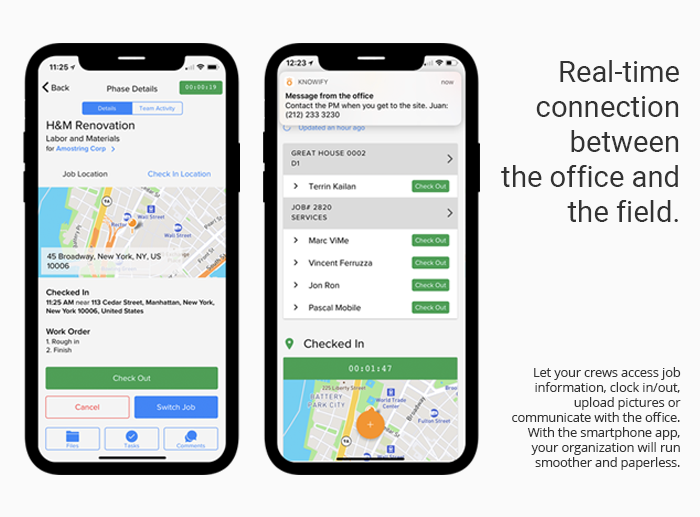 Also, do your self the favor of downloading the mobile app and demo it as though you are one of your employees, to see just how powerful this program can really be. Pros: Makes bids, change-orders, and scheduling easy. In theory - but not actuality - it should link with Quickbooks, which, if working, would be awesome. Cons: Customer service doesn't take the time to determine what is wrong. There are several tiers of people who are trying to help, but they continue to give a quick reaction to solve the problem and don't really help. The program itself only links with Quickbooks occasionally. If you don't input information perfectly, it scrambles your numbers and can throw all of your books off. Getting access to human help is hard. The input work is way more work than the results. Overall: A good idea of what I want. Otherwise, no benefit at all. This software, by itself, is a great concept, but the management team and the connectivity with my normal QB software is abhorrent. We are sorry to hear of your bad experience with our customer support. We at Knowify put an extremely high priority on all tickets and the majority of our customers will agree that this is one of the strongest parts of Knowify (as shown in many reviews on this page). Your specific case threw us a curveball, as you had deleted your access to Knowify on a Friday night. Our customer support team is made up of specially trained technicians based out of the US, so dealing with a non-standard issue in the after hours might take a bit longer, especially if we have to involve our tech team. Even still, we did have your account back up by 7am the following morning. Given that you like the product and the idea behind it, we hope you can work beyond this to try Knowify again in the future. Cons: There are some inconsitincies in the UI where depending on the billing style of a project, different form fields are presented for very similar tasks. When creating a project, it's very important to know what information will be available to share to the client before attributing time or materials to the project. The calendar doesn't bring much value to our business where scheduling can be down to the 15 minute interval and mobile use is necessary. Pros: The easy to navigate website and features, and the fact that they will try to accommodate your business needs within the app. Cons: The support, even from the owner, can be condescending; customer service quality could be improved drastically. A lot of attention grabbing features get added to the site however, they do not appear to be thoroughly tested because they are always failing in some way. The communication between quickbooks and knowify could be improved as well as the zapier integration. The time tracking and break down of services and how you manage projects could also be improved drastically. For what we are paying I definitely expected more. Overall: Overall, definitely recommend if you're a basic contracting company. Does this software work? Yes. Is it for every type of professional service company? No. Pros: I LOVE the invoicing system and contracts and having it sync with emails its great! Also the employees ability to check into a specific job. There is a lot to like. Also your customer service is great. Cons: The CHECK/IN -OUT view vrs REVIEW time screen for clocking hours. I would prefer it these two features were combined with a running clock on clock/in out view. Im really working on my employees attendance record and lateness so when reviewing hours for payroll purposes it becomes redundant when I have to individually "fix" their clock in times. It's clunky and a little redundant. We also had problems with the old app but the new one seems to be working better as well as learning to use the job board more effectively. Also a way to change the job they are working on from the clock in/out view. I personally like this view the best not so crazy about review time. Overall: I have recommended it. Better organization of invoice tracking and employee productivity. Pros: The biggest pro of this is the step-by-step process from bidding to proposal to billing. We are easily able to track and manage each step of the process, produce AIA style invoices efficiently and track all payments in one application. And a huge shout-out to customer support - anytime I have an issue, they respond and are able to help us out within an hour or two (even outside of business hours). Cons: Every once in a while there will be a glitch, sending payments over to quickbooks an extra time (but this also could be our synching with banking...). Either way, it's an easy fix as long as you are also managing your books correctly. 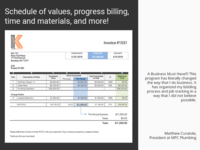 Overall: Job costing & tracking, easy AIA style billing / invoicing. Pros: We all like how we have been able to provide ideas/needs to Knowify and see them integrate many of those into their updates and new options. Cons: There are still some functions that area holding us back in what we are able to do with Knowify, specifically billing. We have been told that they are working on those options, but the sooner those are added the better workflow we will have using their system. Overall: Keeping close tabs on project P&L's is great with Knowify. Project Managers/Admin can pull data at any time to keep up-to-date on project costs. We like being able to use AIA billing through Knowify. Finding one place to apply all job costs to a project is great! Pros: It's easy to use. The layout of menus makes it incredibly easy to navigate. The importing into Quickbooks happens lightning fast. There's a myriad of ways to handle POs making billing incredibly convenient. And the reports are useful. Cons: Searches can be difficult to return to. They lack pagination customization. Sometimes I'd like to see 100+ results per screen! Overall: Quick billing, detailed job tracking, and flexibility. Pros: 1.) Great YouTube tutorials. 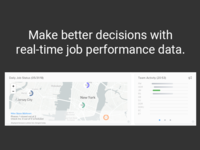 Pros: This software tracks my employee time and job location. Great for seeing how long jobs are actually taking. The estimating portion is awesome once you have your pricing entered. Estimating templates make sure you don't forget parts or pieces to the estimate. Great customer service! Cons: No cons as of yet. Been using this software for over a year. Overall: This software makes sure we are being profitable and shows us where we need to do better on different kinds of jobs. Knowify is a great tool that has transformed our project management. 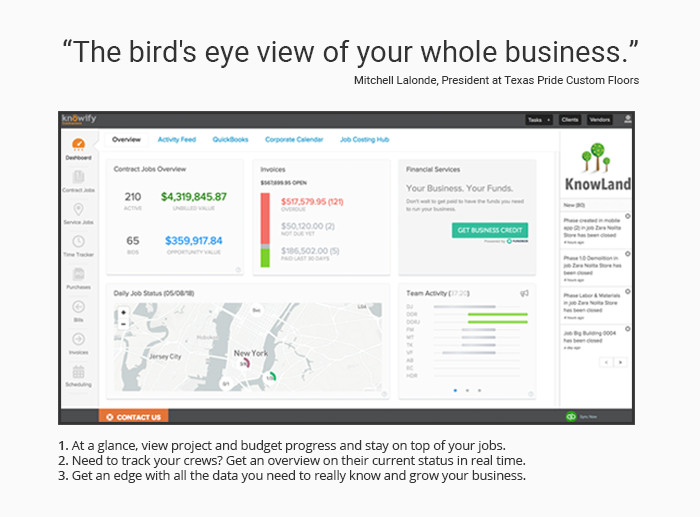 Pros: Knowify is intuitive, manages job costing well, and most importantly ties all aspects of a job together in one, easy to understand space. This software has been a huge time saver. Pros: Once the estimate is approved the office work is over. All employees are able to track there time and materials directly to the job with no extra work involved when it is time to invoice. Cons: My employees do like not being able to view all of there entered time for the last two weeks, but I believe this might not be the case with the last update. Overall: It has saved me hours of paper work when it comes time to invoicing. It is also great to know exactly how many man hours a project takes. Pros: It rolls almost everything into one system. I can easily keep track of my jobs, the progress of each one, and cost them to stay on budget. Knowify gives our business the power to stay paperless with e-sign contracts and proposals. Our customers absolutely love the ease of clicking a few buttons to accept a proposal and make payments. Before Knowify, my desk was a paper covered nightmare - now I am able to just keep it all right there in one place. Cons: Some features are lacking. Sometimes we need to be able to provide a range price on an estimate, and Knowify does not have this feature. It can also be a little challenging/labor intensive to add hours if my employees don't want to use the app on their phone for automatic tracking. Overall: Easy paperless contracts and estimates. Pros: I really love how I can keep track of all my jobs from active to still in bid process. I can schedule guys to any job, do time sheets, and even a catalog to help us keep track of pricing and material pick ups! It topped the cherry for us when we discovered the app.. with many Spanish employees this is the first app I've seen that can work in Spanish. And the punch in and clock out feature along with geo fencing is very nice. Cons: I wish the specific labor rates could be involved in one of the lower plans instead of the highest plan, which is legit the only reason I have to use their highest plan. Overall: So far while still in trial I can not wait to show my boss this who has been relying on me to find a PM software for the company! Excellent customer service very easy to work with! Pros: I like the job cost part of it and the Change Orders. How it gives the client an option to sign them and send them back. Cons: The guys have problems all the time with the clocking in. The app. Is very slow most of the times and sometimes they can't clock in at all. If this can be improved it would be great. Overall: I really do like this software. It has all the features we need I just wish the time app worked better. Pros: Allows me to have a front-end to Quickbooks and provides for a little better job tracking. We previously tracked jobs manually. Knowify also has some helpful reports. Cons: When you first start using Knowify, it is not user friendly. There are many "quirks" in the system. We have submitted requested all through 2018 for some of these to be addressed. Our company cannot be the only user experiencing some of these issues. Using Knowify has helped but is still lacking for my purposes. Examples: adding another default phase for Subcontractors - the entry of this data now is awful. Support has not be terrific. Job numbering - if jobs are initiated in Knowify or Quickbookos, if the are communicating properly, the LAST number issued should automatically populate. This does not happen, even though Support says to mark it in preferences - it is flagged. Overall: Knowify allows me to better track materials and labor. Overall, it's alright as a support tool but I feel it still has a long way to go. Knowify Support basically refers to the user manual for any questions - may as well start there before contacting them. Easily tracks jobs and costs associated with the jobs. Pros: Interacts with QBO. Also like the reports available. Easy to navigate between open and outstanding jobs. Can attach documents all in one place. Cons: Sometimes the feed between QBO and Knowify does not work. When this happens, I call support and they are able to fix it right away. They are very helpful. Overall: All documents and invoicing in one place. Interacts with QBO. We've been using Knowify for a couple of years and continually met our needs. Pros: Ease of use and it syncs with quickbooks, so no double entries when invoicing. They are continually looking for feedback as to which features they should add next. Cons: I wish I could send statements from Knowify, but I'm sure they're working on adding that feature soon. Pros: It allows us to release invoices, in part, each month - something that should be so simple but no-one else seemed to have found a simple way to do it. Support, when needed has been excellent and very prompt. Cons: I would like to have an easier way to visualize what has been billed and what is not billed - but the new dashboard goes some way towards that. Overall: It gives us a solution to a problem that EVERY contracting business must have but no accounts software seems to recognize it as a challenge. Love the Software ! Best one on the Market ! New App is Great ! Pros: Tech Support is Awesome. I get answers to my questions in a timely manner. Company is open to suggestions on how to improve the program . They will customize reports based on my needs . They are always enhancing the Software to a more user friendly feel. Cons: I would like to see more detailed Youtube Videos regarding how to use the software based on the current version. I would like to see more pop up links in the software "Click here to learn more "
Pros: I can manage my leads, my proposals, my projects costs, my time sheets and the easy sync to Quickbooks make our day to day activities much simpler. We tried a lot of apps and Knowify was the only one who offered to customize our proposal templates which helped us extremely since we live in Quebec and needed french communication to our customers. Cons: I would love to be able to manage my leads like a CRM as this would avoid me to pay and have another CRM tool. I would also love to see the capability to sync calendars with Google calendar for scheduled jobs and hopefully for CRM activities :). Overall: The customer service team has been great! They have answered all of my questions, were they able to accommodate all of my requests maybe not but in the end, nothing is 100% perfect but knowify comes pretty close. I would definitely recommend it. Absolutely the best job costing app for subcontractors and trades that integrates with QuickBooks. Pros: The 2-way sync with QuickBooks; the ability to create AIA style billings directly out of the program (no duplicate entering); the integrations with great apps like ClockShark and Tsheets; the great dashboard on which you can monitor the profitability of each current job; the ease with which you can budget and bid from within the software; the wealth of available reports; and so much more. Cons: Some improvements could be made to the service ticket side of the program to make it more comprehensive; if a PO is fulfilled in QuickBooks there is no way to match it in Knowify, so it has to be closed out manually on the Knowify side. Overall: We love sharing this software and its great features with our construction clients. To my mind there is no better job costing app on the market today for subcontractors and tradesmen in commercial construction. Knowify has made our billing so much easier. Cons: Retainage push at final billing should not be combined with current month retainage accrual. They should be separate. Overall: Knowing that all the calculations on my pay applications is correct is invaluable. Pros: Knowify is very user friendly and easy to use. It comes with AIA Billing at a very affordable price. It also syncs to our Quickbooks so there is no need for double entry. Cons: I would like to see a more itemized schedule of values. Overall: It has cut our administrative time in half. Pros: Customer support is second to none. Issues are usually responded to and dealt with, within the hour. Easy to navigate and intuitive. Cons: Some small annoying glitches that pop up from time to time. Usually sorted out quickly and efficiently but annoying nonetheless. Easy experience to ensure job costs are tracked correctly and accurately. Pros: Purchase orders and bills. The synchronizing with Quickbooks works smoothly and saves on data entry as well. Cons: The scheduling features seem to be a little clunky. Sometimes the scheduled time goes into effect right away and other times it doesn't seem to work correctly. Pros: Excellent communication tool, helps to see the job location and if any issues arise immediate results. Cons: Some of the people trying to use the program mainly. Pros: I like that Knowify allows me to do everything from a lead to a bid to a contract. Cons: Knowify can sometimes be finnicky with it's search engines. Overall: After learning more about Knowify I can move easily between it's functions. It makes quoting simple and efficient. Knowify is the best, easiest tool out there hands down. All in one! Pros: Intuitive, robust, affordable, project management, time tracking, start to finish solution for running our service businesses. Cons: It lacks full CRM functionality beyond the customer database. It has plugins for email marketing tools. Love Knowify. It has completely transformed my business for the better. Pros: There is a fast turnaround for new features. You don't have to wait a year. The mobile app is CONSTANTLY updated. Try browsing a platforms app version history instead of customer reviews. Customer service is excellent, and if a solution does not exist for your problem one is created. Cons: The only thing lacking is built-in app notifications and calendar integration (coming soon). Pros: Ability to customize for our business, ease of use, customer reaction to the professional quotes and invoices, customer feedback is not only taken seriously but it is desired to provide the best product. Cons: Needs to be a bit more flexible with customizability. Especially with Project calendars. Overall: Satisfied with where we are right now. Amazing. Couldn't be a better product for my needs and Terrin's support is unparalleled. Pros: The product is perfectly designed for the service industry. It's a very easy to use tool with a very comprehensive feature set that makes running my business a breeze. Cons: The mobile app is very limited in it's functionality for all users. It makes it difficult to do most of the things I'd like to do without being in front of my desktop. Knowify has helped us streamline our estimating process. Pros: Ease of use - Knowify is very easy to use, once set up. Online signatures is a great feature, and makes securing signatures a breeze. Cons: Editing times in the time tracker is difficult. It took some time for our employees to get used to using the time tracker and fixing their time was difficult. Pros: I like the ease of creating proposals, I love the new home screen. Knowify's customer service is top notch. Cons: I would like the ability to enter zero when an employee is out for the day. Would like the ability to print the original proposals and change orders together. Customers complain about the invoicing, it's confusing. Comments: We started running our virtual biotech company on Knowify several months ago, and it's been enormously helpful. Since we have multiple labs (all over the place) doing work for us at any given point in time, and since many of our contracts specify that we cover various costs (like reagents, etc), giving our partners Knowify ID's has really helped us keep track of who is ordering what/when so that when the bills arrive we're never caught blindsided. I've also used it several times to reference contracts and old invoices - which is 100x better than rummaging through file cabinets. It would have been very painful for us to manage the growing complexity of our efforts with our old (manual filing + dropbox) ways, so Knowify is well worth the money for us. Admittedly we haven't had to use the invoicing / client management tools yet - but that's just the nature of our business - we won't have revenues for a few more years at least. Marc at Knowify was really helpful early on when I emailed him with a few questions, so 5 stars for service, too. Thanks for your feedback Dan, we really appreciate the praise. 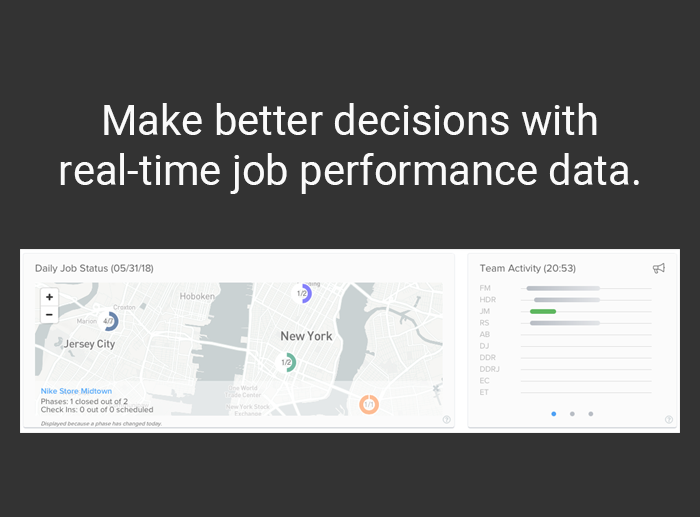 Pros: This program makes it easy to track projects and the cost associated with those jobs. The added functionality of the estimating part saves us from making custom spreadsheets. The customer service is exceptional. Overall: Saves time in estimating and tracking the progress on projects and service. Pros: Allowed us to track and manage everything on the larger project down to the penny. Cons: My older phone didn't support the app for Knowify unfortunately. Overall: At my desktop it was great but going mobile I had to use the browser as the app didn't work for me. Pros: The thing we most like about Knowify is how simple and cost effective this addition to our QuickBooks software has been. We enter all our AR and AP transactions into Knowify and it syncs beautifully with QB. 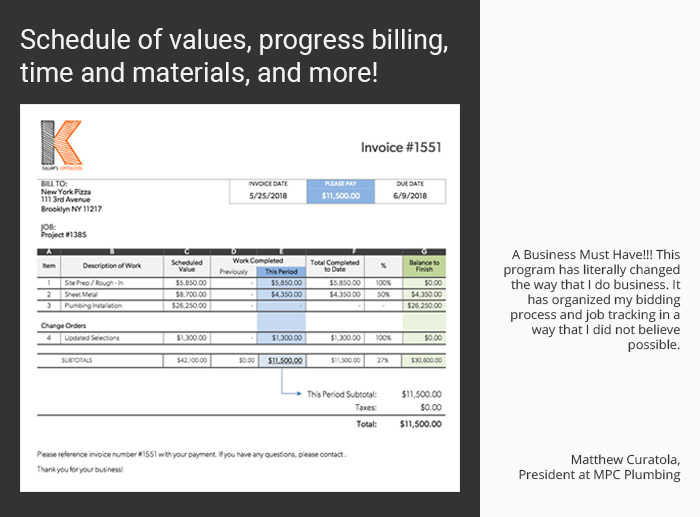 Absolutely love the built in AIA billing format and the ability to email out of the application. We also use the app in the field to capture and review employee time. It's very seamless. Cons: The only thing I'd like is simple back button for the page you are on rather than having to start from the beginning. The only product out there to attempt to tackle the various types of jobs and billing in the trades. Pros: The ability to create different contract styles, as well as T&M work is invaluable to a company that has many different customer types. Also, doing service work tickets and dispatching has become easier for the office staff. The time keeping per job has been much more accurate than our old paper system creating more billable hours instantly. Cons: The app has been challenging for the field techs to use to add materials. We track inventory and have around 2800 different parts, it can be cumbersome to find the correct part to add to a ticket. Knowify helped our company streamline our job costing and invoicing. Pros: I LOVE the time card input, the dashboard view of active jobs, and the expense syncing functionality to Quickbooks. Cons: For jobs that are in process when the software is implemented, there is not a good way to get the data into Knowify to sync with Quickbooks. It would be helpful to have a little more flexibility when creating invoices, and if you had the option to create a detailed budget (Professional mode) for a job in Knowify but were able to track expenses at the job level. Overall: Streamlined job costing and invoicing. 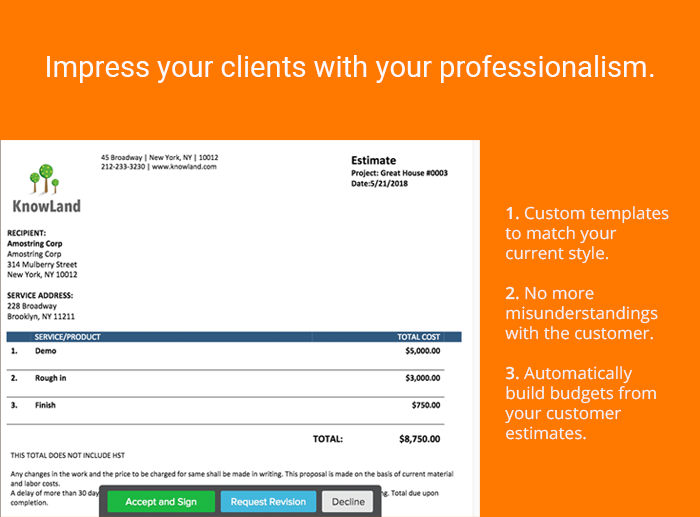 I have a small contracting business and this software combined with QuickBooks works great. Pros: It allows me to track costs per project. Time entry is very easy and when combined with QuickBooks allows me to run payroll quickly. The reporting system makes it easy for me to perform my work in progress calculations and all my financials. Overall: The ability to easily track my projects costs and to keep track of employees time in order to run payroll. Pros: It's a comprehensive software solution for all facets of my business. The customer support team is great whenever I need help. Pros: Knowify is great! We are using their new software for property management. It is very intuitive and easy to use! The integrations are fantastic and keep work flow going. Their mobile app is very simple so all of our supers are able to navigate through the app in English or in Spanish which is a huge plus! Cons: There are no cons to Knowify. We signed up before our free trial ended we loved it so much! 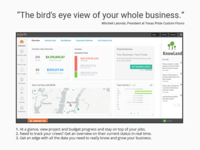 Pros: The bird's eye views of your whole business. Ease of sending purchase orders and work orders to vendors and contradctors. Cons: Would like the ability to rearrange individual line items (material line items) within a job phase on the proposal and contract phase. Overall: Organization on a job-by-job basis so I can pinpoint where I can take advantage of making money and identifying where things cost us money. Nice to know overall. Excellent to know by the job. Pros: Pretty well organized, effective time tracker, nice to track profitability. Cons: Too many emails to employees (it sends an email every time a purchase is approved), complicated invoicing on time and materials jobs. I want more flexibility with how I want my invoices to read. Overall: I was very unimpressed with tech support. I do love the slickness of the software and our employees absolutely love it as a time tracker. Pros: The customization you can make to quotations, line items and the catalog. Cons: The scheduling software is very basic. and does not have abilities to add more details so we use another program for this. Overall: We've been able to take most of our business electronically, which helps us improve our business and helpls our client communicate with us. Pros: Customer Sales Tool, and contract managment. Cons: Amount of effort to have Tsheets apply to the Job to start. The way a contract is decided, Your Phases, might not be how I want to track costs and time. I don't trust the numbers. I want all hours and materials accounted for to the job as a whole. I don't want to spend hours deciding what phase each expense or hour spent goes to. Overall: Takes so much time to ensure Time is put to the correct job. Wish it made a HARD Job Number, sequential, noneditable. Pros: The customer support is awesome. I get questions answered pretty quickly. The support staff remains in contact with me until the issue is resolve and I am satisfied. They also are willing to take suggestions to make the software better for the users.